Cardington senior Taiylor Hubley signs her letter of intent to play softball for Wilmington College. Sitting with her are her parents, Jamie (l) and Jason Hubley. 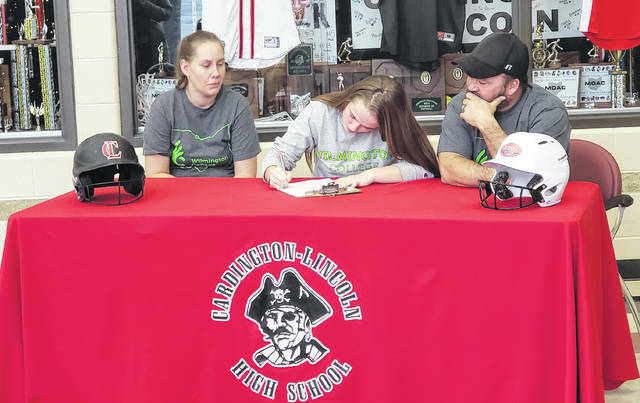 Cardington’s Taiylor Hubley will continue playing softball after her upcoming senior season, as she signed a letter of intent to play for Wilmington College on Friday. Hubley noted that it didn’t take a long time for her to make her decision after spending a bit of time at the southwest Ohio college. Hubley expects to play center field for Wilmington, noting that her play in the outfield was one aspect of her game that got the college’s attention. “How aggressive I am in the outfield and base-running — my speed,” she said when describing what impressed the Wilmington coaching staff. Hubley is looking forward to all the new experiences that will come from being on a new team with new people around her. However, before moving on, the Pirate senior feels she and her team have some unfinished business to handle in high school, noting that after nearly claiming a state title last spring, she wants to take that final step.